Ginza (銀座) is a district of Chūō Ward, Tokyo, located south of Yaesu and Kyobashi, west of Tsukiji, east of Yurakucho and Uchisaiwaicho, and north of Shinbashi. It is known as an upmarket area of Tokyo with many department stores, boutiques, restaurants and coffeehouses. 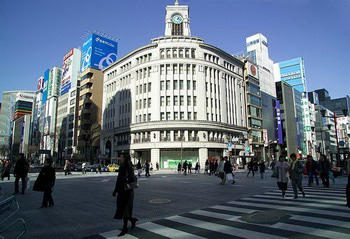 Ginza is named after the silver-coin mint established there in 1612 during the Edo period. Modern Ginza began in 1872 when, after a devastating fire, the district was rebuilt with two- and three-story Georgian brick buildings designed by the English architect Thomas Waters, along with a shopping promenade on the street from the Shinbashi bridge to the Kyōbashi bridge in the southwestern part of Chūō Ward. Most of these European-style buildings are gone, but some older buildings are still there, most famously the Wakō building with its clock tower. Ginza is a popular destination on weekends, when the main north-south artery is closed to traffic. This policy began in the 1960s under Governor Ryokichi Minobe. Tokyo Tower is a tower in Shiba Park, Minato-ku, Tokyo, Japan. It is 333 m (1093 ft) tall, making it one of the world's highest self-supporting steel towers and the tallest man-made structure in Japan. The Ueno Zoo is a zoo, owned by the government of Tokyo, and located in Taito Ward, Tokyo, Japan. Copyright (C) 2006. Tokyo-TravelGuide.com. All rights reserved.